This has probably been the most interesting race this season. Like a lot of people, I had Simmons picked as my ROY prior to the start of the season, but I did not expect him to be this good. He was THE guy that changed the 76ers culture and expectations. Don’t get me wrong, I love Joel Embiid. Though, his minute restrictions make it hard for him to change things like Simmons did. The “Fresh Prince” (not sure how I feel about that nickname yet) took the Sixers out of the tank race and into the a playoff push. 16 points, 8 assists and 8 rebounds makes one very well rounded player. Oh yeah, he also shot almost 55%! Still, most of the season, he served as Embiid’s sidekick. After Embiid went down with a face injury, Simmons had his chance to prove himself. He took over the reigns and led Philadelphia to the third seed in the Eastern Conference. They go into the postseason riding a 16 game win streak. Wait … but what about Simmons’ competition? I’ll admit Donovan Mitchell presents a valid argument. Of course, I’m referring to his numbers and impact on the Jazz, not his own personal argument that Simmons isn’t a rookie. Come on, Donovan! This was his first NBA season, which makes him a rookie. As a fan of scoring, Mitchell’s nearly 21 points per game make me want to give the award to him, but I force myself to look at the rest of the body of work. In all honesty, Mitchell didn’t score that much. Aside from that scoring, he didn’t do much else, averaging just 3.7 assists and 3.7 rebounds. Yes, he helped the Jazz become a playoff team when I expected them to be terrible, but does anyone really expect the Jazz to do anything in the playoffs? I know we’re talking about the regular season, but in the landscape of the NBA today, making the playoffs doesn’t mean much. That being said, how a team fares in the playoffs is a good indicator of how good they actually are. 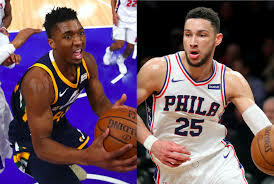 Unlike the Jazz, the Sixers could actually make some noise in the playoffs, thanks to my Rookie of the Year, Ben Simmons. Next Who’s to Blame for the Cowboys’ Failures?